Tonino Griffero: What is unique about your book (within today’s literature on atmospheres), and how does it speak to its audience? Chrstian Julmi: The book works out the creation and development dynamics of situations and atmospheres in organizations, on the basis of a phenomenology of the felt body. It acknowledges situations and atmospheres to be the most fundamental and everyday features of coexistence in organizations. It thus focuses on what these two aspects have in common, which is frequently neglected in management and organization theory. 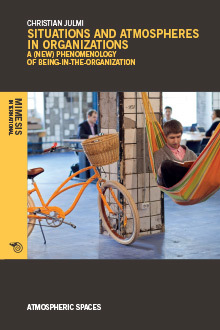 By understanding a person primarily as a corporeal and subjective being, the book offers an alternative anthropological view of people within (and outside) organizations. The book is addressed to all researchers and practitioners who are interested in a phenomenological way of looking at organizational coexistence. In addition, the book provides one of the few English-language introductions to Hermann Schmitz’s new phenomenology, whose reception and application in German-speaking countries is such that it is practically impossible to acquire an overview. T.G. : How do you explain the high level of interest currently enjoyed by the notion of atmosphere? Why does the concept of atmosphere seem today as the best explanation of collective emotions and social situations? C.J. : Emotions have long been studied under the lens of psychology, following a strict separation of a person’s interior and exterior world. Now it is increasingly acknowledged that emotions are not only a personal, but also – or mainly – an interpersonal or relational phenomenon. The problem with the interpersonal level is that, from a dualistic point of view, the line between cause and effect tends to blur. For example, it is hard to explain whether collective emotions affect people, or whether people affect collective emotions. In contrast, phenomenological research on atmospheres operates in a non-dualistic manner. Phenomenologically, atmospheres are something that lie in-between, or go beyond, subject and object. By denying the ‘interior world’ dogma of psychology, it becomes possible to access aspects of pre-reflective life experience. T.G. : When one expands and applies the notion of atmosphere and emotional climate to whole historical periods, does he/she maybe run the risk of the same vagueness of previous concepts (for example Zeitgeist)? C.J. : First of all, I don’t think that the concepts of atmosphere or Zeitgeist are, or need to be vague, even though the phenomena of atmosphere or of Zeitgeist are essentially vague. Since any historical period is unique and can only be approached hermeneutically, this phenomenological vagueness is not a weakness. When this vagueness is reduced, we lose that room for interpretation which is necessary to work out historical contexts. Thus, what we really need is a shared and clearly defined guidance or framework, that is broad enough to encompass a variety of phenomena without being arbitrary. In my view, the concept of atmosphere perfectly fulfills these criteria. However, when someone wants to explore atmospheres within a specific historical context, she or he has also to understand the related social side. Only then, it is possible to understand why specific atmospheres occurred. The concept of atmosphere therefore needs to be complemented by the concept of situation. While atmospheres refer to emotional qualities, situations are not emotional as such, although they are usually permeated by atmospheres that lend them a defining character. Regarding the concept of Zeitgeist, I would say that it relates more closely to the concept of situation than to the concept of atmosphere. Nevertheless, I prefer the concepts of situation and atmosphere, as defined by philosopher Hermann Schmitz, because they are more generic. T.G. : What future is there for the research on atmospheres in organizations? C.J. : Although there is a nascent, minor turn towards non-dualistic research on atmospheres in organization studies, this kind of research is still far from being well established. I hope that our understanding of atmospheres in a non-dualistic manner, within the context of organizations, will be further strengthened, because I see great potential there which is still largely untapped. For example, my book works out different communication patterns that affect the atmospheric perception within situations. Such conceptions could be followed by qualitative empirical research. I also believe that this approach is of great practical, as well as theoretical relevance. Philosopher Guido Rappe and I recently wrote a book on atmospheric leadership (Atmosphärische Führung, Hanser Verlag 2018) that primarily speaks to practitioners, but that is theoretically substantiated by the theory of atmospheres in organizations. T.G. : What are the potential risks deriving from the extensive use of this new paradigm? C.J. : As we are still far away from an extensive use of a non-reductive and phenomenologically informed paradigm of human and social being-in-the-world, I do not see much risk for now. Like with any hermeneutic understanding of science, there is no single point of truth that everyone can agree on. Where there is interpretation, there is also dispute. But that’s fine because a science whose assumptions cannot be questioned, becomes religion. On the other hand, progress needs some agreement, so I hope we’ll find a proper way between a dogmatic and a self-destructive future.